The Pine Grove Jacket is our most versatile winter coat for kids: It has all the features of a winter coat plus a full powder skirt. 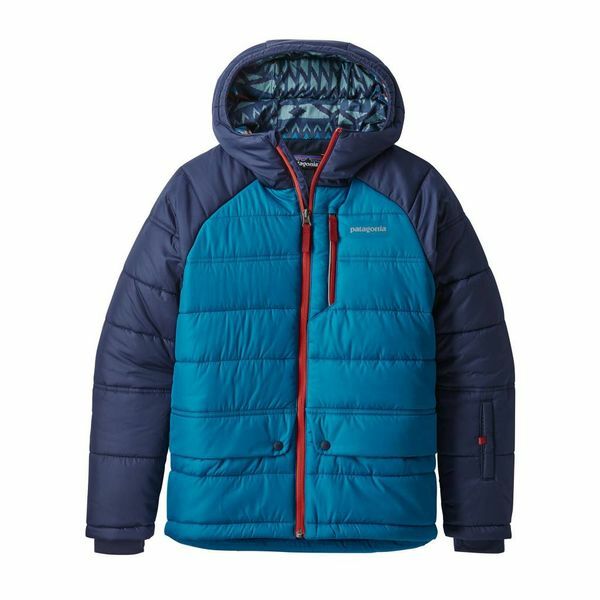 The quilted, lightweight windproof shell has high tear-strength and a DWR (durable water repellent) finish for water-resistance. It’s insulated with 200-g (150-g in the hood) Thermogreen® 100% polyester (92% recycled) that provides excellent warmth and stays warm even when wet. In extra cold weather, there’s an insulated three-panel hood, which has a shaped opening and polyester taffeta lining. When he heads to the slopes, the full powder skirt comes in handy as does the pass pocket on the sleeve, an internal pass loop for traditional hanger passes and a slight drop-tail hem for added coverage. Other details include a center-front zipper with a reflective zipper pull, an internal wind flap and zipper garage to minimize chin chafe. The zippered chest pocket has pass-through hole for media cord; drop-in pockets secure with hook-and-loop and snap closure. Articulated sleeves with grow-fit feature increases length by two inches; internal microfleece cuffs have thumb holes. For cozy warmth, there’s tricot lining at the back neck and back of chin guard. Hand-me-down ID label.